The Satin Bowerbird is found in the forests of Australia. Like all bowerbirds it clears a small area and decorates it with carefully collected objects in order to attract a mate. These can be flowers, pebbles or even discarded sweet wrappers, bottle tops or old biros. 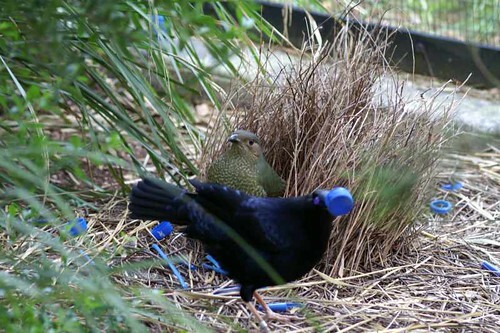 The Satin Bowerbird has a particular fascination with shiny blue objects. I think I may have been one in a previous life! Patrick claims to be finally satisfied with his bike. I've never been dissatisfied with my bike, in fact it was love at first sight, but I still can't resist tinkering with it, adding yet another shiny gizmo to make it even more perfect. 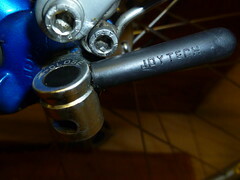 Its probably fortunate that I'm not terribly mechanical. The major moving parts are left severely alone except when simple things like chains or brake blocks wear out but there is always something peripheral to tinker with. 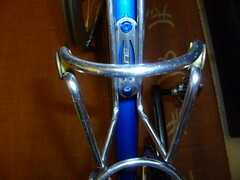 Quick release skewers for instance. 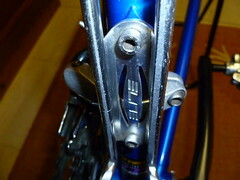 They hold the wheel in the dropouts. Job done, no more to be said. But somehow I got to thinking that mine aren't terribly attractive. Perfectly functional, but hardly a thing of beauty and a joy forever. So I found myself typing 'Quick Release Skewers' into Google and suddenly a whole colourful world opened up. No more black plastic levers but a rainbow of pretty colours, with titanium skewers too. There are limits to my obsession. Some of these things cost almost £50 and I'm not prepared to spend that sort of money to save 25g per skewer, even if they do come in shiny blue! A little searching revealed that chromoly ones are also available at a fraction of the price and in that irresistible shiny blue. Well I had to have them didn't I? And it didn't end there. I discovered coloured bolts too. 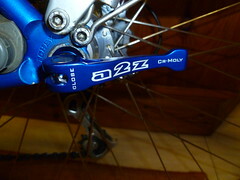 Who wants ordinary stainless steel bottle cage bolts when you can have anodised ones, in, you guessed it, shiny blue? So thats four of those added to the order. I did wonder if I was going a bit far but I'm rather pleased with the effect. I'll be steering well clear of those Satin Bowerbirds though! Posted by Hilary on November 18th, 2011. Hilary wrote: I still can't resist tinkering with it, adding yet another shiny gizmo to make it even more perfect. Ah... I'm not tinkering with my bike any more (I'm tinkering with the other one). I'll tell you about two acquaintances of mine, Mike and Albert. Mike is English and has certain views on things. He's considerably to the left of eccentric. Albert turns up for a cycle with Mike with a brand new bike. Blue. They go cycling. After about 10 miles Albert says.. "Mike you never noticed something". Mike continued cycling with eyes straight ahead. "The bike, Albert?". "Yes". Pause. "Albert, a bike should be black or red, not blue", says the bould Mike. Well, he has been mercilessly ribbed for it for years. I have an orange bike, a grey one, a black one, a blue one a red one and a red white and black one. I've had dark green, white, a pink one and all kinds of subtle shades. I'm not a bower bird, I'm a magpie. It depends on the shade of blue. Hilary's blue is a kind of electric blue. I think it works well on a bicycle. 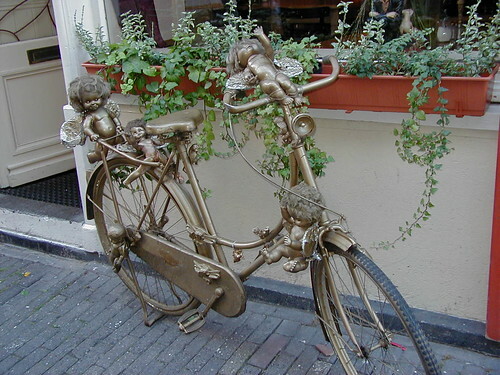 Hilary, your post reminded me of this bicycle which we saw in Amsterdam ten years ago. We recognized it immediately, having seen it three years earlier. Your sense of decor is actually quite modest. LOL – definitely not my cup of tea Kern! Actually I have read that the Sudanese are very keen on customising their bikes with objects like that!